Murphy Library holds Yard Sale Friday and Saturday from 9 to 2. Donations are gratefully accepted anytime! “I want to help get more books for the library,” Hiwassee Dam resident Lili Molina told Murphy Library head librarian Jeff Murphy during a recent visit. When asked her age, she emphatically stated, “I’m still four.” Her parents Becky and Mario Molina encourage her reading, but her interest in fundraising is all her own idea. When Murphy heard Lili’s comment he pulled out baseballs and mitts to show her how willing he was to play ball her way. 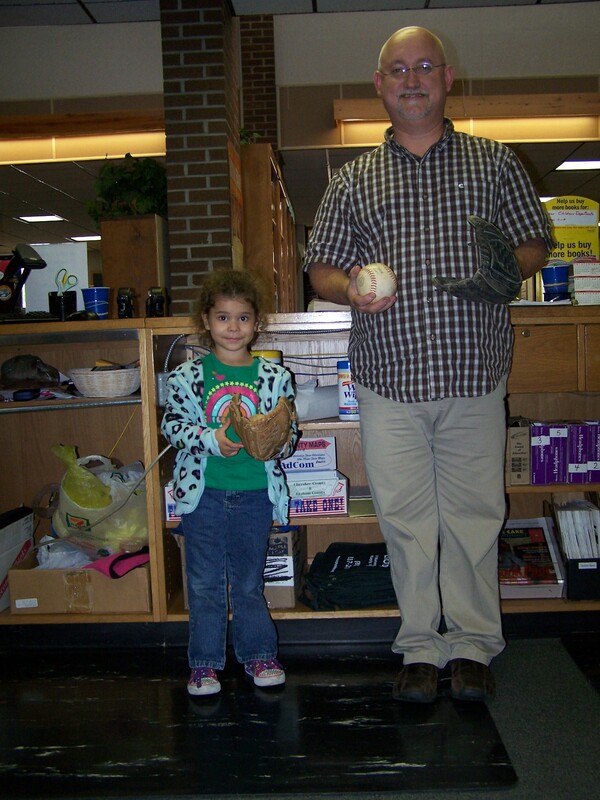 The baseball items and lots more will be in Friends of Murphy Library’s Trash to Treasures Yard Sale this Friday and Saturday, May 4 and 5, from 9 a.m. to 2 p.m. Funds raised will help the library do what Lili and many other readers want: buy more books for all ages. Donations are still being accepted. Call 837-2417 for details. Scholastic Books sends their biggest truck laden with books for their book fair at the Murphy Library. That’s because children love to read in our town and parents and grandparents know books make great gifts. Librarian Jeff Murphy announced that the truck would be arriving soon. The Scholastic Book Fair will run from October 7 to October 19 in the main room of the library. 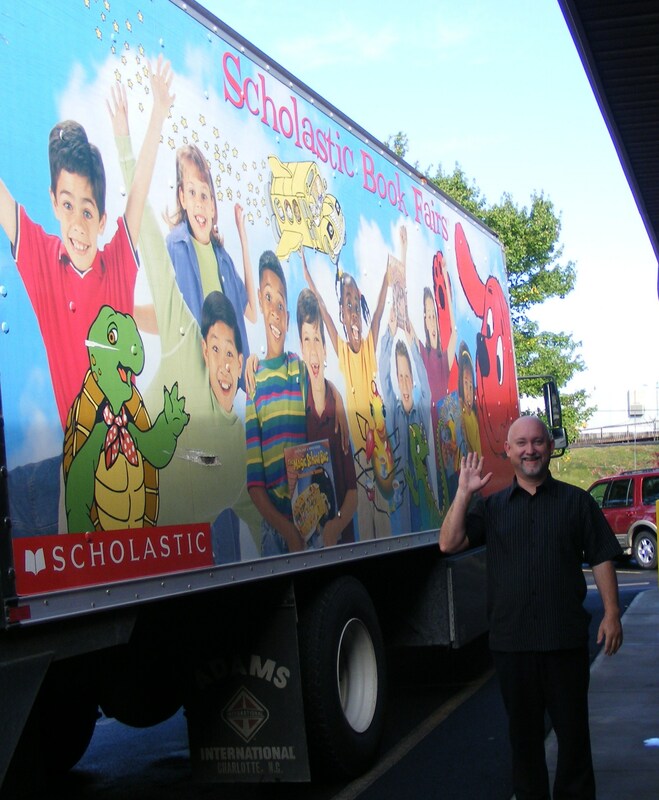 Jeff Murphy will be greeting a Scholastic Book truck the week of October 4 just like he greeted this truck in 2009. The Scholastic Book Fair will be held from October 7 to 17. All sorts of books will be available for purchase. It’s not too early to find Christmas presents, assistant librarian Melissa Barker added. Actually, anytime is a good time to buy a child a book. Books include award-winning fiction, picture, easy reader and chapter books. There are special bookmarks and software for sale too. Adults will also find books. The library accepts credit cards, cash and checks. Call 837-2417 for details. Brothers Restaurant holds Community Night for Murphy Library on Monday from 4:30 p.m. to 8:30 p.m.
Friends of Murphy Library are celebrating Community Night at Brothers Restaurant, 5722 Highway 64 West on Monday, April 5 from 4:30 to 8:30. Everyone is encouraged to bring friends and family to dine at this family eatery. On Community Night, Brothers donates a portion of the night’s proceeds to the sponsoring organization. The money raised will help children. Librarian Jeff Murphy and Sarah Arnaudin, the Youth Services librarian, want to update the nonfiction books in the juvenile area at the Murphy Library. Many are outdated and there is nothing like bright, shiny books to entice children to read. Reminder flyers can be found at Murphy Xpress Lube on the back of their invoices or at the Murphy Library. Call 837-2417 for details. Nantahala Regional Youth Services Librarian Sarah Arnaudin leads Grace Bowlin, Chloe Decker, Jordan Phillips, and Jillian Phillips as well as several visitors from out of town in a Storytime march. The Murphy Library is sponsoring Community Night at Brothers Restaurant on Monday, April 5 from 4:30 to 8:30 p.m. to raise money for new children’s books at the library.